Earlier in the week I told you about these big ol’ hams they were selling for $.99/lb and that I picked up a nice one of 22 lbs. and put it in the freezer future use. Now we’re a family of four in a new town with no family, so what in the heck are we going to do with a 22 lb ham? Remember Forest Gump, well just replace shrimp with ham. And boy do the kids love the ham. First I carved out the bones and used them in a double batch of Black Eyed Pea Soup for a get together at our new neighbors on New Year’s Day. Then it was ham and cheese sandwiches, er paninis, in our new panini maker. Ham and scrambled eggs for breakfast today. Then another double batch of Black Eyed Pea Soup and a batch of Split Pea Soup today. 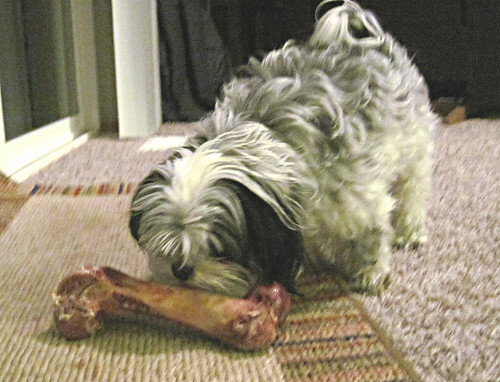 Even our 5.5 lb Shi Tzu is a beneficiary of the ham extravaganza, he’s working on the bones. Well, at this point, we’re about half way done with the ham, no kidding. I’m thinking some ham fried rice for dinner tomorrow. Would you believe I have never had split pea soup? I know, it’s a shame. I’m going to remedy that this weekend by making this recipe! This looks great! 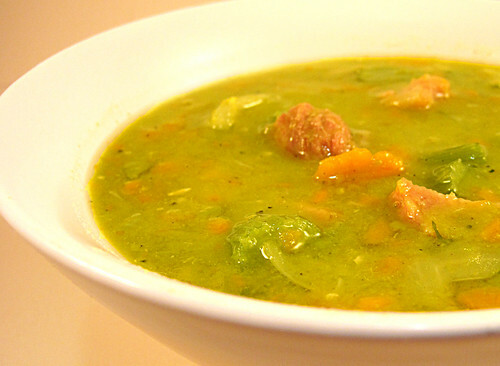 I LOVE split pea soup, and the crockpot version looks super easy to do. Bonus. So, this was a while back and guess what, the local store had hams on sale for, you guessed it, $.99/lb last weekend. This time they were in the 10 lb. size so I got two and threw ’em in the chest freezer along with the other great deals we’ve recently picked up. Cute picture of Maverick! Can he even drag that big bone? I see you’re discovering some of the wonderful markets in Seattle! Crock pot soup sounds great! Really nice soup and the color is beautiful. It definitely needs some ham. I just remembered now, I do have some smoked ham in the freezer. Better make this soon. Made this last night. Thanks for the great (and incredibly easy!) recipe. We all enjoyed it.